Alexander rear-facing in the Cosco Scenera at 3 years, 1 months old. He weighs 35 lbs. Alexander rear-facing in the Britax Wizard at 2 years old. He weighs 30 lbs. 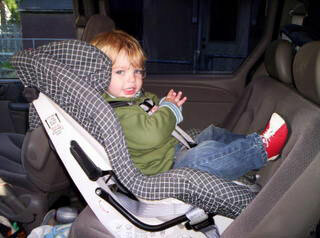 At 2 years 6 months Alexander went over the rear-facing weight limit (33#) & had to be turned forward-facing. When he was 2 years 8 months he had a stomach virus & went back down under 33 pounds & was able to rear-face another month. He was more then happy to return to rear-facing! He later returned to over 33 pounds & returned forward-facing. When Alexander was 2 years 9 months old, we realized that he could still rear-face if we moved him from his Wizard to a Cosco Scenera. The Scenera has a higher rear-facing weight limit of 35 pounds. This picture shows Alexander at 3 years, 1 month, with his new baby sister Madeline, 6 days old. Madeline will also rear-face to the limits of her car seats! (Madeline's seat is at a 45 degree angle, to support her neck. Zander's seat is more upright, because he is older & heavier. 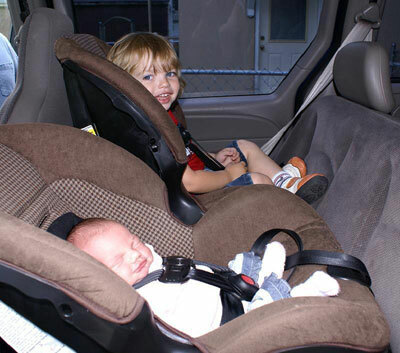 Research is showing that older heavier rear-facing children are safer with their seats upright. The seat being more upright at higher weights reduces the risk of over-rotation). He rode rear-facing until shortly after this picture was taken, when he went over the 35 pound weight limit.